"This is Fred. 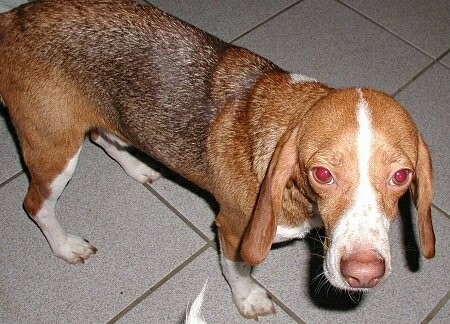 He is my two-year-old full-bred Beagle. He loves everyone he meets and can’t get enough of people. Your temperament section on them is pretty much dead-on! He is extremely curious and as a puppy he loved to chew on things. 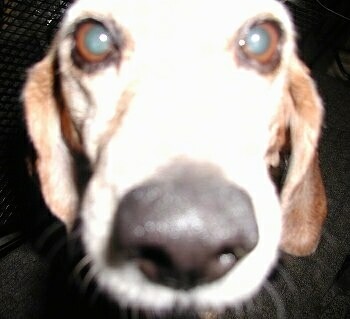 I once caught him chewing a hammer he dug up from my yard...the metal end of it! I have a ¼-acre lot with the back half fenced in. He roams free a good 3 hours a day out there. So far, he has presented me with 2 squirrels, 3 birds, a handful of garden snakes and a lizard about every hour he is out there. They’re fast little dogs! My only main quirks with him are he likes to dig in the yard (usually when he follows a creature underground) and if he is on the prowl for something, he won’t listen to me at all. Otherwise, sit, stay, paw, rollover, play dead, speak are all easily understood. I am in the process of training him to grab a soda from the fridge. That one’s been tough." This is Rusty. 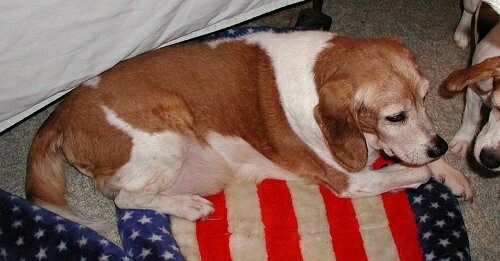 He's a 13-year-old red and white Beagle. 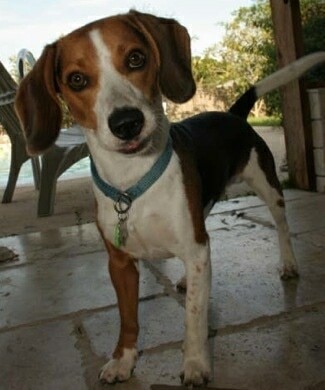 "This is Barney, a liver tricolor. His nose and eye rims are a pinkish color, and his eyes are lighter than the regular black tricolors' eyes. 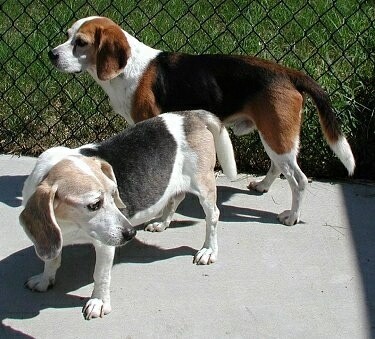 This color is not preferred in the show ring, but color should not be a consideration when getting a Beagle as a pet. Color does not affect personality!" "Butch is the dog in front, Charlie is behind him. Charlie is a normal black tricolor. Butch is a blue tricolor." 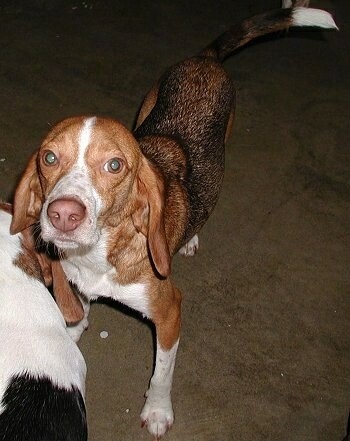 "I think Dixie is technically a tricolor, but she has so little white on her that she's referred to as a black and tan by most Beagle people who don't show their dogs. 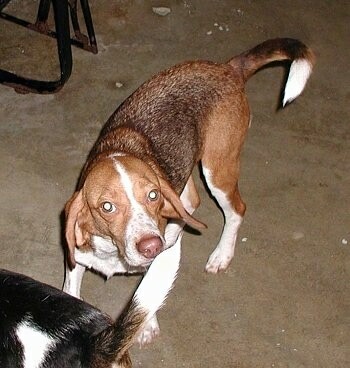 Her only white is a small spot on her chest, a little white on her paws (a Beagle characteristic) and a few white hairs on the very tip of her tail (also a Beagle characteristic)." "What is that thing? Does it smell good? Can I eat it?" 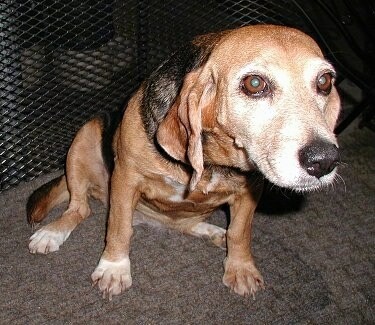 Beagles follow their noses all the time—often right to trouble!